I cannot believe we leave for Pairs a week from tomorrow. I say this and PANIC starts to rise. I have too many projects at work to leave behind and neither my husband nor I are properly trained (my M.O. apparently). However, I am going to put all that behind me and look forward to these wonderful 10 days with Gabe and try my very best not to micromanage our time abroad. I was at the start line of the 2015 Princess Half Marathon when they announced the inaugural the Disneyland Paris Half Marathon. My brain instantly thought, "Oh that would be nice". Then the dates were announced "September 23-25th" which falls on the weekend of our wedding anniversary. So what's a girl to do? Text her husband at 5:30am before running a half marathon to let him know we would be going back to Paris in a year and a half. Never in a million years did I think it would happen. Thanks to hotel points and properly shopping international flights, we are headed back to Europe! Being a veteran runDisney runner, I will honestly say that this has been a much different experience leading up to the race. Keep in mind, while this weekend has runDisney's name all over it, this is being ran by Disneyland Paris, not rD and this is their first race. The course and the race guides have yet to be released. We have bib numbers but no idea of which corral we will start in. After running the Dublin Marathon with ASICS in 2015, I learned first hand that international races are not the same as US events and you find many of these things out at packet pickup. So fellow DLP runners - stay calm and keep in mind that you are going to be running in a beautiful country and will be making history at Disneyland Paris! 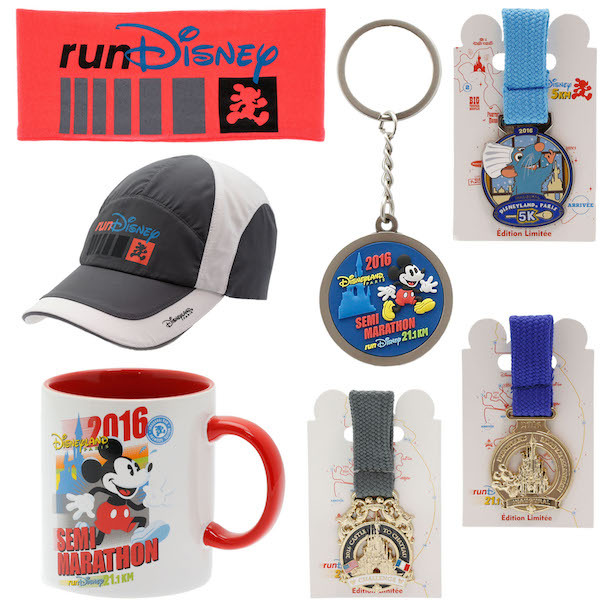 Amidst the unknown, we got a sneak peek of Disneyland Paris Half Marathon Merchandise! Something I did not expect to see prior to arriving at the expo so this is a treat! Now keep in mind, this is just a preview of some items that will be available at the expo. I've seen some people complaining on facebook groups that they wished this or that was available. Disney cannot post every item. 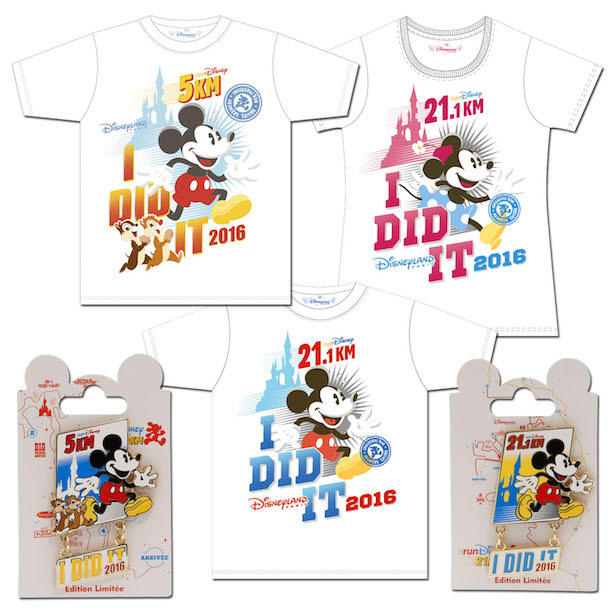 Also, if this is your first runDisney event, historically in the US races, merchandise goes quick. MANY MANY MANY people on the forums have been asking about runDisney Paris Half Marathon Dooney and Bourke. The bags which celebrate race weekends are a huge collection piece for runners (disclaimer: I own a Disney DB but I don't have a runDisney one). 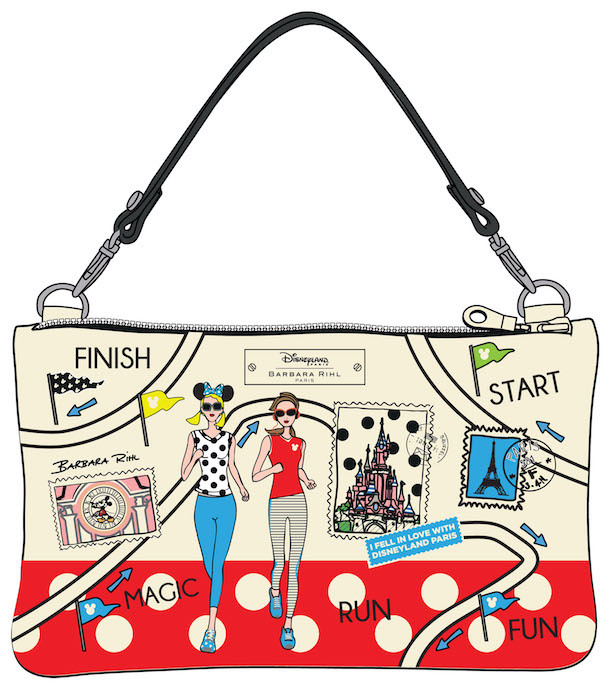 Disneyland Paris followed suit with a bag and chose to team up with renowned French designer Barbara Rihl. This is a fun bag but I will have to see it in person before I make a decision - I really hope it comes in a cross body and if so, it will be a done deal. It features Sleeping Beauty Castle, Disneyland Hotel, the Eiffel Tower, and a nod to Minnie Mouse’s legendary red polka dot print. If you are attending race weekend and want this bag, quantities are limited and I wouldn't hesitate to make the purchase. The purse will have a retail price of €150. 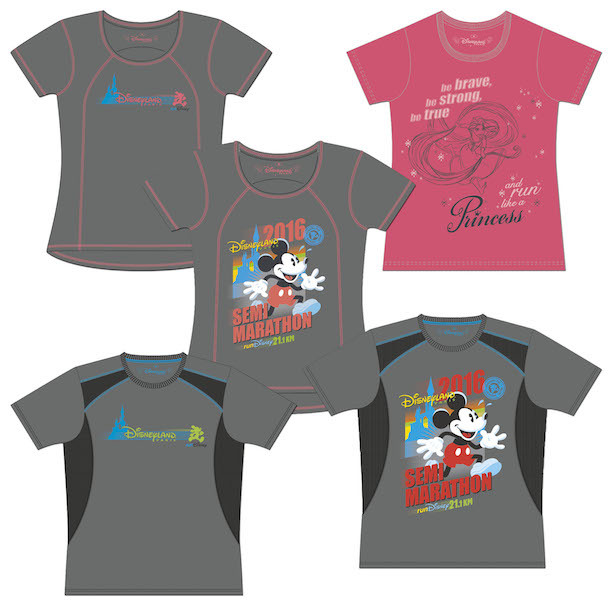 Some of the Disneyland Paris Half Marathon Weekend tech shirts are shown above. I tend not to purchase tech shirts at expos as I have over 100 at home which I am considering turning into a blanket. However, the top left shirt may be coming home with me. What I love about this - the distances are in kilometers! The 5K will always be 5K. The 10K will always be 10K. However, I think I need a shirt that says 21.1K! Pins, hats, and coffee mugs - I really hope there is a wine glass to make my collection! A week before we leave, I am just as excited as I am nervous. This will be my 18th Half Marathon but I have no idea of the course, the elevation, what to expect for on course entertainment or dining around the hotels. I have never been to a Disney park other than our four in Orlando - this will be my first Disneyland experience. I recognize how fortunate and blessed I am to have a husband who loves to travel as much as I do - who didn't blink an eye when I told him we should go to Paris and run a Half Marathon. I look forward to reporting back and sharing our experiences in Paris and DLP!